As a digital artist from Japan Mikati studied classical sculpture and drawing at an art university. Looking at the stage she created, which is the largest in the Burn2 festival, it stands tall at 144 meters by 144 and it floats 25 meters off the ground. Mikati said the stage had to be off the ground for the Burn 2 festival. So what she did was build propellers like an airship from a studio ghibli movie. She also reduced the weight of all parts so it floated easily. Studio Ghibli is the animation studio headed by Hayao Miyazaki who made such flims as Spirited Away and Princess Monoke. Mitaki knew about those films. 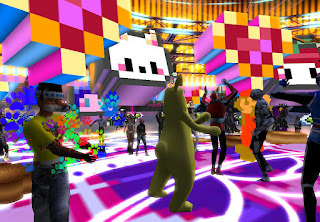 The DJ Obi Galli played lots of electronic tunes old and new for the party people at the Guru Guru stage. So long as I was dancing and talking to Mikati, there was always a lot of avatars like myself enjoying the great music and the graphical eye candy which Mitaki made. Mitaki’s main influence is the Nintendo era of the 80’s with games like Super Mario and Megaman. When I warped to her Guru Guru stage, I was surrounded with bright colors and 8-bit graphical icons floating in a circle. The stage was packed with characters like what looked to me power rangers and sonic the hedgehog. There was even was even some mega man characters and me and her talked over video games. She mentioned that Capcom made the Mega Man series and also Street Fighter 2 games. In her words, the video game movement created a generation hooked on these types of games on the old Nintendo Entertainment System and the arcade revival from Capcom’s Street Fighter 2. That’s a certainly a valid point. Even someone who barely played video games was influenced by those video games one way or the other. I told Mitaki that I make shirts in Second Life based upon an old game I used to play on the Game Boy color. 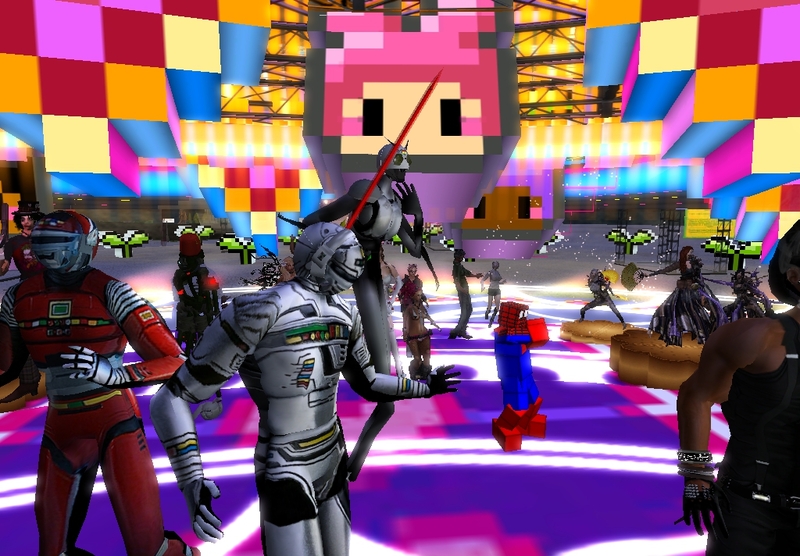 But her Guru Guru stage wasn’t her first creation in Second Life. Mikati also created Kuru Kuru World for the Museums of Rome Capital. Using a LEA or Linden Endowment Arts grant she created Pico Pico Life from a full-sim land grant. 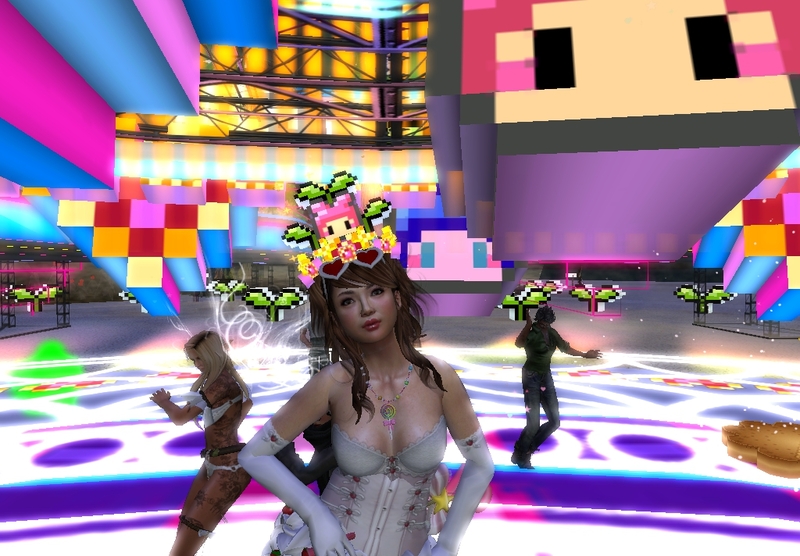 Another of her achievements was The Cake at SL9B that took up four sims! I wonder how long and how many digital avatars it would take to eat such a massive cake. Her artwork was also featured on her flicker page among other photos. One picture which really stood out was a pink 8-bit explosion which symbolized the nuclear bomb from the 1940’s that was dropped on Japan near the end of World War 2. It was used for the Burn 2 in 2010 called the pop atomic. In Mitaki’s words, it changed the Japanese culture forever and the 8-bit console were powerful symbols of 20th century civilization. Or at least what’s viewed by Japanese culture. Mitaki Slade was also jovial and fun to talk with. When I started talking with her she mentioned that she was in the SL Newser before about SL8B before. I told her it would be an honor to write about her and she seemed to appreciate that. Grease Coakes: Oh really? Cool Well I’ll be glad to honor you again and publish an article about you for the Newser again. Mikati Slade: Yayyy! I am really glad! 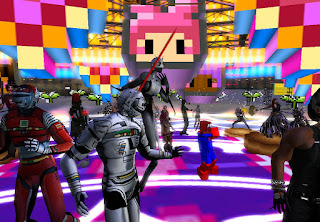 If you get the chance check out her artwork available on the internet or in second life. I had a fun time talking with her and seeing her art live at the Guru Guru stage.